Spearmint Tea is not only cool and refreshing, but incredibly versatile. Enjoy it on its own, or mix it with some of your favorite teas for an exciting new taste sensation. In the world of herbs, few things say refreshing quite like spearmint. The cool, stimulating quality of its leaves has made it a worldwide favorite herb for countless centuries. Naturally, spearmint leaves also create an exemplary herbal tea. Both instantly classic and incredibly versatile, you can enjoy Spearmint Tea in any number of ways. Served hot, it is a flavorful and dynamic herbal tea certain to stimulate your senses. When chilled, the classic taste of spearmint provides a cool, refreshing sensation that satisfies with every sip. Best of all, Spearmint Tea has the perfect balance of smooth flavor and potency to complement most other herbal teas. Mix Spearmint Tea with some of your other favorites, like the enjoyably tangy hibiscus for a unique, satisfying blend. 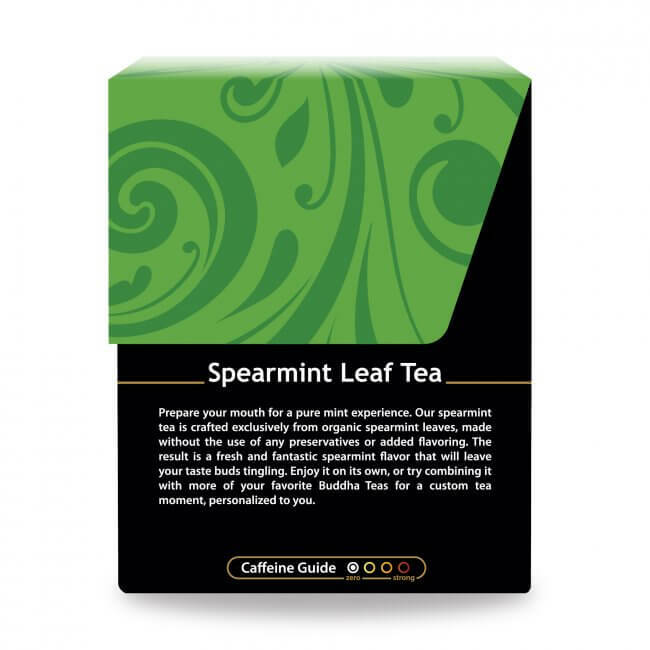 Spearmint tea can offer much more for your teatime than flavor alone. Adding spearmint to your favorite tea, or sampling its fresh taste on its own, will provide you with an added boost of vitamin A, vitamin C and several B vitamins. Spearmint is also exceptionally high in calcium and iron, and offers a good amount of magnesium, potassium, copper and manganese as well. Like most herbs, spearmint is a natural source of antioxidants, and even offers important nutrients such as protein and fiber. All these things and more can easily be enjoyed with every sip of spearmint tea. Relaxing in a comfortable chair with a soothing herbal brew can be one of the best feelings in the world. Experience the luxury of a warm, comforting cup of spearmint tea any time of the day with Buddha Teas organic spearmint tea. We utilize some of the finest fresh herbs, spices, and roots to craft our unique herbal teas. 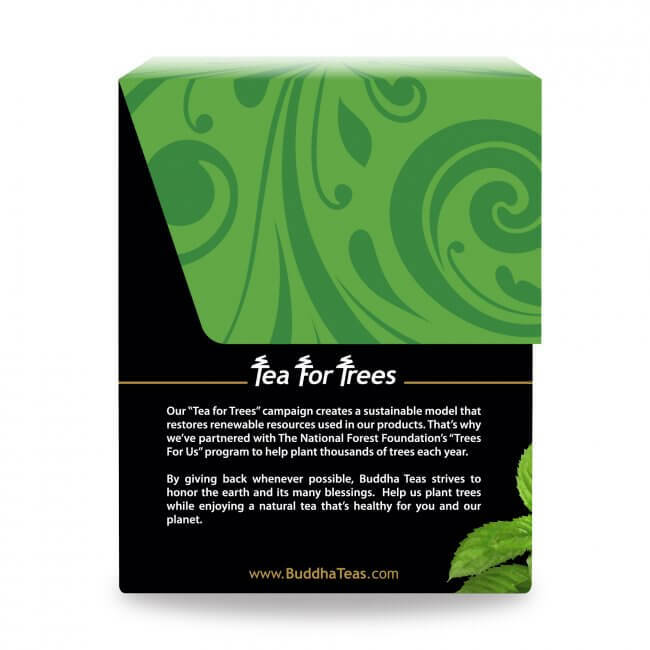 Buy organic spearmint tea from Buddha Teas, and savor the taste of pure herbal tea packaged in unbleached tea bags. You’ll feel assured knowing that your tea comes without any of the unwanted chemicals or toxins that can be found in other bleached brands of tea. I love mint teas and this one has just the right amount of mint flavor. This tea has a refreshing taste. 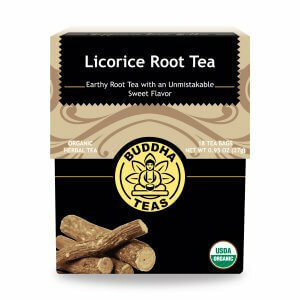 I also mix it with Licorice tea and steep in a cup with some cinnamon and fresh ginger. What a treat! This tea has been amazing, it has helped me with digestion and hormonal balance. Cant wait to order my next box! I've finally found THE ONE. I've been looking for a good spearmint tea to help with h-issues and this is by far the best I've tried. The taste is better than any other brand I've come across. After I brew a cup of tea I like to re-use the tea bag again in a cup of cold water with a splash of lemon for a refreshing drink. I'm officially a customer for life! From the first drink I knew this was an awesome blend with quality. Like the fresh flavor taste, will buy them again. I LOVE this tea. It is definitely my "go to" tea. It is great for winter symptoms. I have used peppermint tea for many years, but have to say that after trying the spearmint I won't go back. I think the spearmint has a slightly sweeter and milder mint flavor than the peppermint. My whole family enjoys this one. care for. I wanted only spearmint tea and this has a good flavor. Tried it hot and also as iced tea. Usually I drink peppermint teas but I decided to try something different, and since I have only had spearmint mixed with other herbs I decided to give it a try. It was love at first cup. I get the sweet minty smell and taste that's refreshing and doesn't make my stomach turn like some of the overpowering peppermint teas I have had. Excellent flavor. Not overpowering but so much flavor. You can tell its fresh! Best minty tea Ive had for a long time!